We’re a dozen games into the season and the Tigers, with a few hiccups, are off to a respectable 7-5 start. Despite the day/Pacific time starts and my living outside the Tigers Radio Network, I’ve been able to keep decent track of these first few series and, while mindful of small sample size they represent, I was beginning to notice something concerning. Last year’s Tigers series on this site was entitled “The DET Offensive” because, with the addition of Prince Fielder, the team figured to be an offensive powerhouse. Detroit made it to the World Series– no complaints about the outcome here– but they didn’t exactly run away with things, barely overcoming the Chicago White Sox to win a weak division. They also didn’t exactly score at will. In fact, the 2012 team was slightly below average in the American League for runs per game. It’s frustrating when your team is supposed to be built to score and they can’t, and it’s especially frustrating when they can’t seem to come from behind to win. It seemed like Detroit often would jump out in front early, but if the opposing team later took the lead, a late-inning comeback likely was out of the question. Tiger fans knew that fielding defense was supposed to be a weakness but that offensive firepower was supposed to overcome any inability to hold a lead. When it was needed in the late innings, though, that offense often failed to materialize. If anything, 2013’s Tigers have an even more robust offensive roster, with Victor Martinez and Torii Hunter joining Fielder, Miguel Cabrera, and the unsung Austin Jackson at the top of the batting order. Last year’s fielding defense wasn’t as bad as everybody thought, and with four great starting pitchers, the only major question was the bullpen. Detroit’s “closer by committee” approach to relief pitching has been anything but coherent this year, as everyone has noticed. Not as many people are taking a critical look at the Tiger bats, however, and it’s more than Martinez’s slow start: once again, Detroit can’t come from behind to win games late. I’m not sure if the above discussion of 2012 represents some reverse-projecting on my part, but I know that when I had a few days to think about the first twelve games of this season, I realized I had the definite feeling that this team was having trouble scoring runs when they needed them in the later innings, and it felt like a continuation of something I had noticed last year, so I decided to test my theory against the numbers. 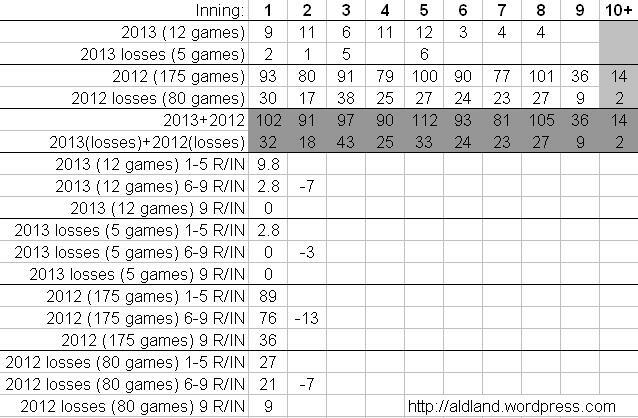 First, the data for the 2013 season appears to support my feeling that the Tigers aren’t scoring late. Second, the data for 2012 does not quite support my recollection of how things went last season, although the team did score more early than late then, too. One thought I had was that the trend might be more pronounced in losses, but that does not seem to be the case. This is my first attempt at testing my own perceptions as a fan against statistics and at conducting my own statistical research, so comments are especially welcome. This entry was posted in ALDLAND and tagged austin jackson, baseball-reference, detroit, miguel cabrera, mlb, music, prince fielder, sabermetrics, sb nation, thomas dolby, tigers, torii hunter, victor martinez, white sox by AD. Bookmark the permalink. There’s a healthy discussion going on in the comments over at http://www.blessyouboys.com/2013/4/15/4228630/bay-of-cigs-run-distribution-science-and-the-liklihood-of-a-detroit#comments, where the editors were kind enough to feature this post on the front page last night and this morning. 1. 9.8 R/IN seems HUUUUUUUUGE. They averaged nearly tens runs an inning? I suspect that dividing that number by the number of games in question will yield the desired statistic. 2. Selecting your window is important. Selecting windows of size 1-5, 6-9, and 9 is an important decision. Ideally you made this decision before you analyzed any data [otherwise you need to include a rather technical so-called “penalty factor” for selecting your window after looking at your data]. I suspect that this isn’t a problem, but is important to be clear. 3. The final [obvious] thing I see, is expected variation. That is, there is an expected variation. The odds are the number of runs scored in some innings is going to be more than the number of runs scored in other innings. How much variation is expected for “uniform” playing style can then be compared to what you’ve seen under the alternative hypothesis of, I don’t know, a “giving-up” playing style. If you’d like me to take a look I would be more than willing to do so. 0. Thanks for the offer. I’ve been getting a lot of good responses and suggestions here and over at BYB. 1. I guess the statistic could more accurately be dubbed “R/IN/Season.” I decided not to present the R/IN number over games because it just ended up being long, messy decimals. The numbers I used– to me– made it easy to evaluate the feeling/hypothesis I was testing without giving up numerical accuracy. I think you’re right as a technical labeling matter, though. 2. I did choose the windows that would constitute “early innings” and “late innings” before tabulating the numbers. I decided to break out the ninth inning after seeing the results, though, because they seemed strikingly low, even given the caveats for this (to which I alluded in the post). 3. When I update these numbers, I think I’ll use the aggregated AL numbers as a point of comparison for inning-by-inning variation. I do want to say, though, that what I was trying to test was not the variation between individual innings but whether the team scored less late than they did early. Enjoying your statistical analysis. Maybe you can come on over and drop some knowledge on the Musings of a Displaced Tigers Fan blog. I’m looking for contributors who bring different things to the table. Thanks, and thanks for stopping by. I’ll definitely be reading reading your site, and if there’s anything you think I could add to what already looks like a thorough site, that would be neat. Displaced Tiger fans definitely need to stick together. Saw your post over at Musings of a Displaced Tigers Fan (and BYB) – really great stuff. I’ve long felt the same as you about the Tigers late-inning scoring, especially in tight games, so it’s surprising to see the stats prove me wrong yet again. Thanks for taking the time to analyze this data, the work that went into it is certainly above my head; but it’s great to read these break downs. You’ve got a follower in me, and hopefully we see you around Musings, too. Thanks, Travis, and thanks for stopping by. I think the numbers actually support our common intuition, at least for this season, and with some advanced parsing of the 2012 data that’s probably beyond my current capabilities, the 2012 numbers might support it too. As I said at BYB, I think I will try to update this information around the All-Star break to see how things look with a more appropriate sample size. My hope, though, is that we’ll all be distracted with one big number in the W column. Just wanna say that this is extremely beneficial , Thanks for taking your time to write this. Thanks, and you’re welcome. More to come as the season rolls on.